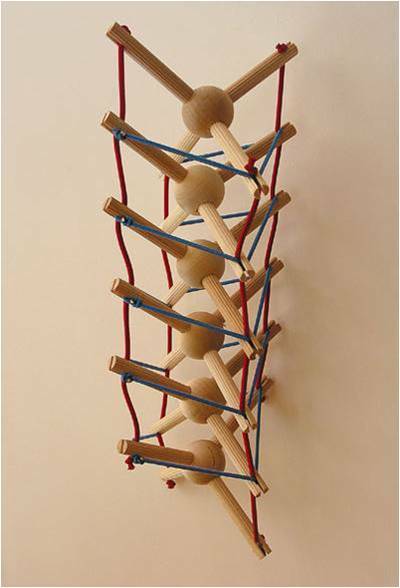 Read here about the biological spine, and how tensegrity explains its structure and enables new therapeutic models. The human spine, or vertebral column, is a column usually consisting of 33 vertebrae, the sacrum, intervertebral discs, and the coccyx situated in the dorsal aspect of the torso, with spinal discs between bones. It houses and protects the spinal cord in its spinal canal. It became commonly known as the backbone or spine, so named for its spinous processes. Flemons created and markets two main tensegrity models of the human spine, the stellated tetrahedral model and the spiral model. He published a text describing the model. He begins by noting that traditional descriptions of the spine imply "a rigid, vertical architectural structure.... however, there are no fulcrums or hinges in tensegrity models and the discs are seen more as couplers than as direct load bearers. Each vertebral body in a spine bears a formal topological resemblance to a stellated tetrahedron. A sequence of these tetrahedrons suspended as a tensegrity mast can illustrate the equivalent spinal properties of load bearing combined with fl exibility and rotation. In this description the vertebral mast is suspended by means of ligaments and muscles from the pelvis." 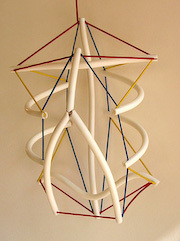 Tetrahedral Spine Models by Flemons" link http://www.intensiondesigns.com/models.html"
Flemons also models the spine as a type of tensegrity mast "first described and built by the artist Kenneth Snelson. 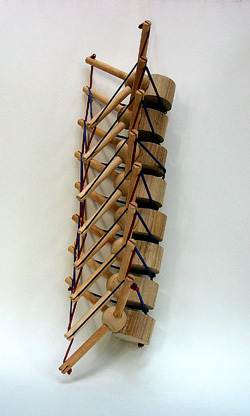 This Vertebral Spiral Mast is composed of six compression spirals and six tension spirals. Half spiral clockwise; the other half spiral counter-clockwise. It suggests the agility of a snake or the fl exibility of a cat’s tail and can be tensioned to create S-curves that are common to both. 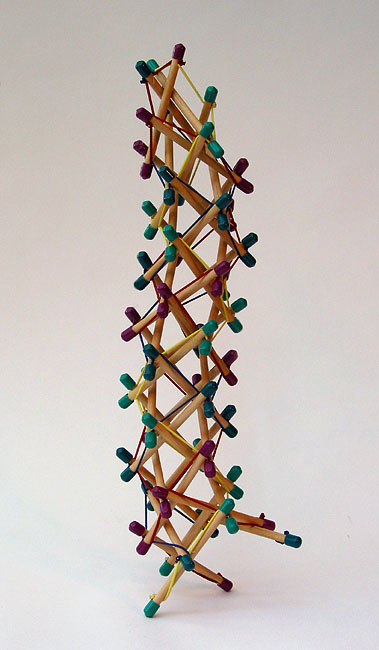 This tensegrity mast demonstrates pure compression and tension. It is purely an analytical examination of the forces involved in a flexible load bearing mast." 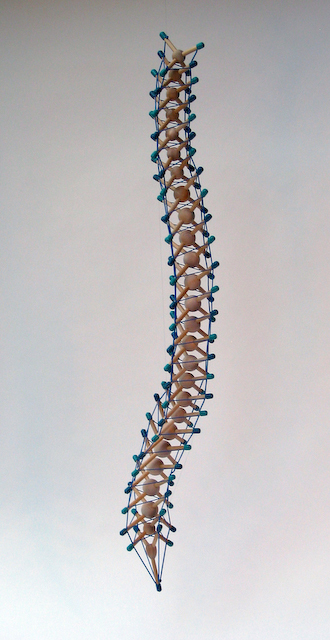 Tetrahedral spiral models by Flemons" link http://www.intensiondesigns.com/models.html"
6 nucleated tetrahedral struts in a vertebra-like column, by Flemons" link http://www.intensiondesigns.com/"
human rib cage abstract model with curved struts by Tom Flemons" link http://www.intensiondesigns.com/"
26 tetrahedral nucleated stuts in a column, forming a vertebrate-like structure, by Tom Flemons" link http://www.intensiondesigns.com/"
Spine, spiral vertebral mast, models 05-TVM-3 by Tom Flemons" link http://www.intensiondesigns.com/"
Spine, tetrahedral model, model 05-TVM-3 by Tom Flemons" link http://www.intensiondesigns.com/"
Spine, tetrahedral vertebral mast, model 05-TVM-3by Tom Flemons" link http://www.intensiondesigns.com/"
Spiral Vertebral Mast by Tom Flemons" link http://www.intensiondesigns.com/"
Thoracic vertabrae by Tom Flemons" link http://www.intensiondesigns.com/"
The presentation is a short, illustrated overview of biotensegrity. In this system of total body modeling, the limbs are not an assemblage of rigid body segments. They are semi-rigid non-linear, viscoelastic bony segments, interconnected by non-linear, viscoelastic connectors, the cartilage, joint capsules and ligaments and with an integrated non-linear, viscoelastic active motor system, the muscles and tendons and connective tissue. The author cites these main attributes of the tensegrity biomechanical model: it coheres independent of gravity, 60° coordination instead of 90°, triangular truss system, energy efficient, geometrical non linearity, the size is in theory unlimited, the applied load is distributed in all the structure, and the strength and the resistance of the whole exceed that of its components. This page was last edited on 18 January 2019, at 08:14.